Due to doping violations, UWW redistributed seven quota spots across men's and women's freestyle, and Greco-Roman wrestling. The changes come in response to athletes found with small concentrations of meldonium in their system at the European Olympic Qualification Tournament and the Asian Olympic Qualification Tournament. Molinaro finished in third place in the 65 kg. freestyle weight class at the Second World Olympic Games Qualifier and claims one of the quotas vacated by two Polish and Ukrainian athletes. Molinaro won the right to compete for an Olympic berth by winning his weight class at U.S. Olympic Team Trials in April. An NCAA champion for Penn State in 2012, he won a gold medal the Pan American Championships in February and won both the Grand Prix of Spain and Guelph Open in 2015. With Molinaro's addition, the 2016 U.S. Olympic Wrestling Team is now complete. The U.S. qualified an athlete in every men's freestyle weight class, as it has at every Games since the style's Olympic debut in 1904. 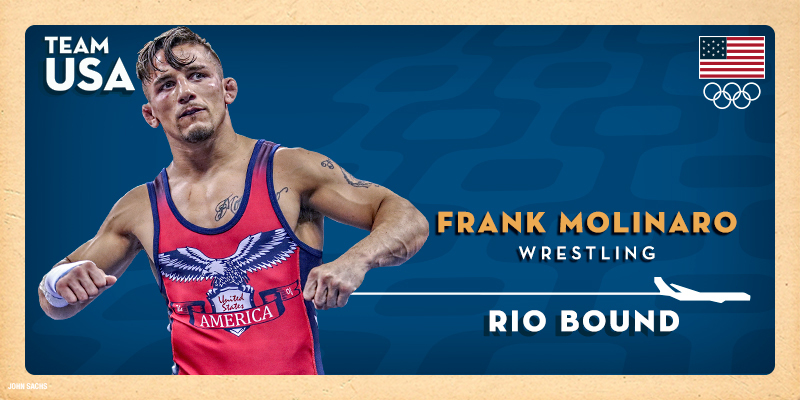 Molinaro joins men's freestyle wrestlers Daniel Dennis, Jordan Burroughs, J’den Cox, Kyle Snyder and Tervel Dlagnev; Greco-Roman wrestlers Andy Bisek, Ben Provisor, Jesse Thielke and Robby Smith; and women's wrestlers Haley Augello, Adeline Gray, Helen Maroulis and Elena Pirozhkova.